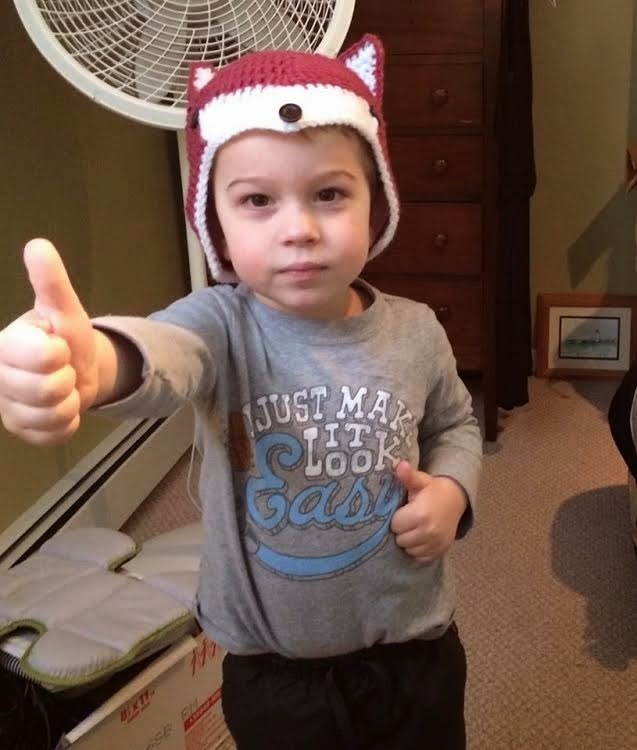 If you ask my three year old grandson Grant, WHAT DOES THE FOX SAY? Depending on his mood; he will most likely shake his "bootie" and sing "Ring a ding, ding, ding, ding ,ding a ding ding. His imitation of the Danish pop duo Ylvis is spot on. The lyrics are catchy and he is adorable singing it...a true musical genius. (At least to us he is.) 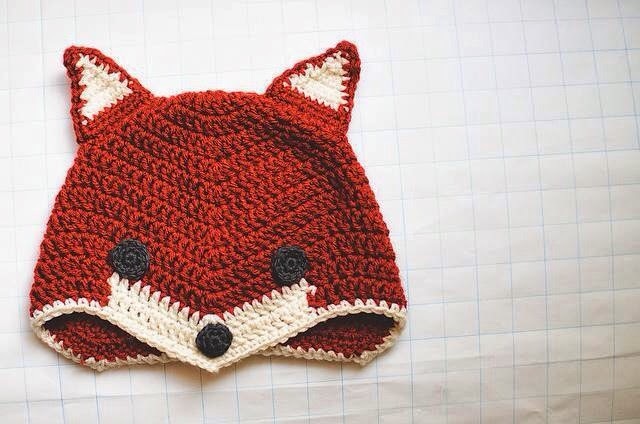 So of course I had no choice but to make him a fox hat for these chilly Spring days, 'cause that's what I do. (Some of you will remember the owl hat debacle. He hated it and refused to wear it. It was scratchy and It scared him. I can't say I blame him.) Being the eternal optimist I hoped for better luck with this one. So back to the stash I went. Thankfully the pile of unused yarn seems to be shrinking a bit since my commitment to finish things. Low and behold, I found a skein of soft, rust colored yarn. I don't remember now what I bought the yarn for or how long I have had it but it was perfect for this project. Because my grand-son lives in New Hampshire and we are in Massachusetts, I put the hat in the mail. Grant loves to get mail so I knew he'd be thrilled to get the package and he was..... until he saw it, and my daughter asked him to put it on that is. Well, as luck would have it Grant wasn't "in the mood" so like any good mother my daughter bribed him so she could get a picture of him wearing it to show me. And like any good toddler he took the bait. Here is Grant reluctantly posing for a quick snapshot in exchange for the promised handful of M & Ms. I'm told he hasn't put it on since and even down right refuses to wear it. I continue to check things off of my "Finish This list" at a snails pace or even slower. For a long time now I have started each day with my "Week At A Glance" calendar in front of me. I write down what I NEED to accomplish, and things I WANT to accomplish. The following day I check off what I have done and carry over to the next day the tasks I didn't complete This keeps me somewhat organized but I have to admit sometimes I look at the carried over list and change my mind; this is where the eraser comes in handy. I am a big believer of "out of sight, out of mind". One entry though has hounded me for a very long time. Call Janie, Call Janie, Call Janie, oh for God sakes call Janie already!!!!! You see, at least three years ago I ran into the daughter of one of my mom's best friend, you guessed it.....Janie. 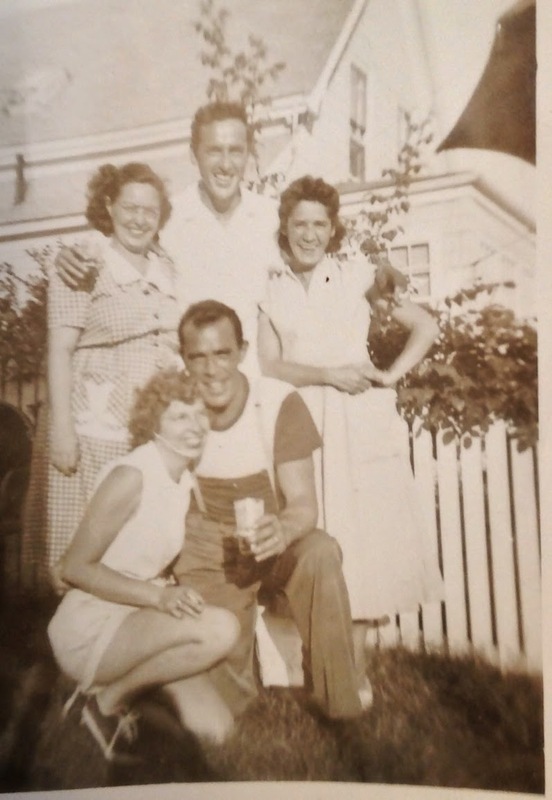 She told me she had been going through some old photos and that she had come across some great old pictures of my mom and dad that she wanted to show us. She asked me to call her to set up a time that I could bring my mom over and look through the pictures. Ughhhh, while this is certainly right up my ally I never found the time or motivation to make the call, until two weeks ago that is. I called Janie and clearly she was thrilled to hear from me. We set a time for the following Saturday to meet for our long overdue visit. I am so glad I did. What a wonderful and memorable time we had. We sat at the kitchen table and poured over picture after picture. 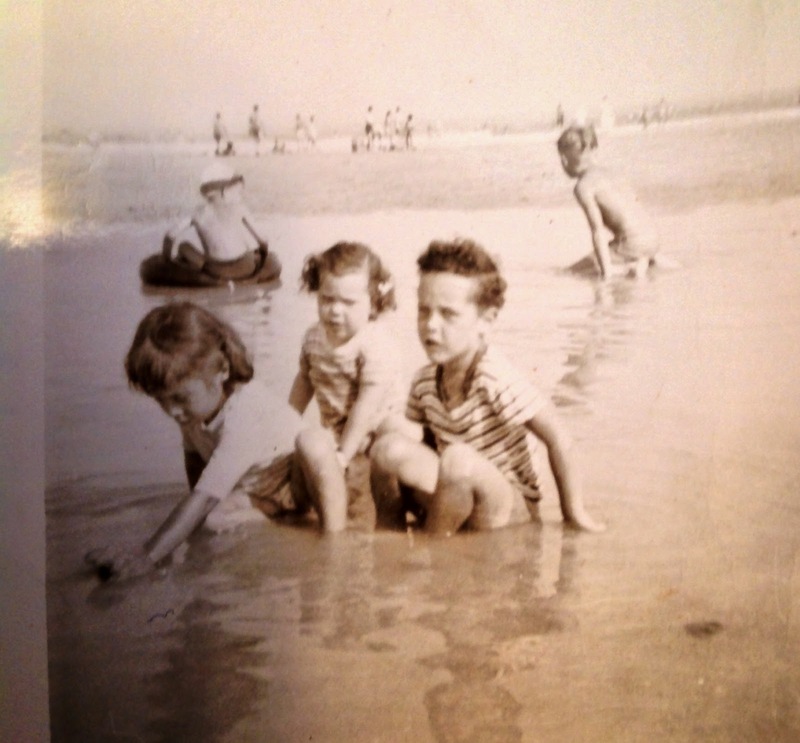 In those moments time melted away and my mom was able to relive the " good old days" with my father and their babies. Most of the photos were taken over 60 years ago. 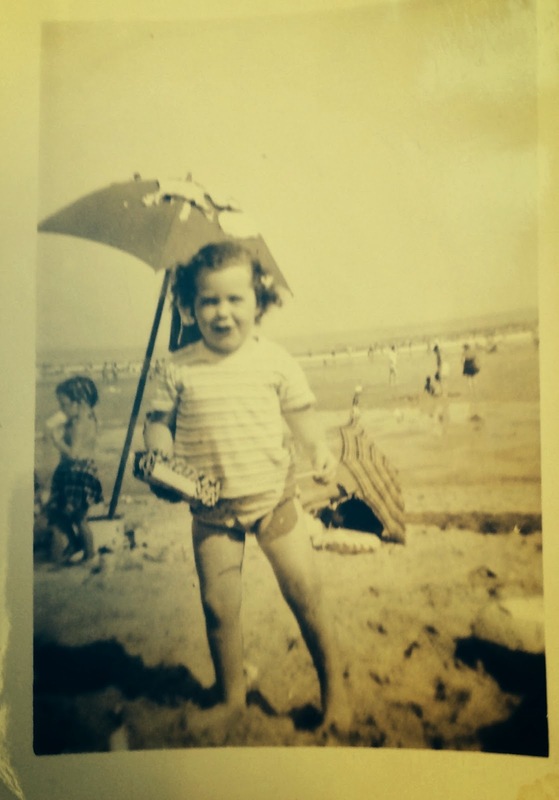 My mom said those years were some of the happiest times of her life. The afternoon flew by and we finally wrapped things up and said our goodbyes with a promise to get together again. I hope we do. My mother is 86 years old now and I treasure each day with her. I took copies of as many photo as I could with my I-pad.